Badlands National Park (Lakota: Makȟóšiča) is an American national park located in southwestern South Dakota. The park protects 242,756 acres (379.3 sq mi; 982.4 km2) of sharply eroded buttes and pinnacles, along with the largest undisturbed mixed grass prairie in the United States. The National Park Service manages the park, with the South Unit being co-managed with the Oglala Lakota tribe. The Badlands Wilderness protects 64,144 acres (100.2 sq mi; 259.6 km2) of the park as a designated wilderness area, and is one site where the black-footed ferret, one of the most endangered mammals in the world, was reintroduced to the wild. The South Unit, or Stronghold District, includes sites of 1890s Ghost Dances, a former United States Air Force bomb and gunnery range, and Red Shirt Table, the park's highest point at 3,340 feet (1,020 m). Authorized as Badlands National Monument on March 4, 1929, it was not established until January 25, 1939. Badlands was redesignated a national park on November 10, 1978. Under the Mission 66 plan, the Ben Reifel Visitor Center was constructed for the monument in 1957–58. The park also administers the nearby Minuteman Missile National Historic Site. 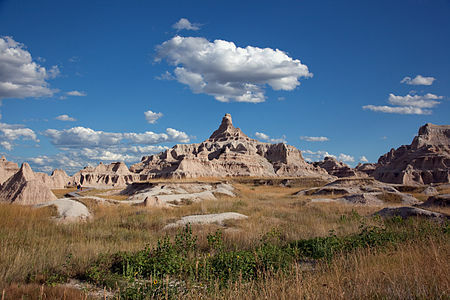 Movies such as Dances with Wolves (1990) and Thunderheart (1992) were partially filmed in Badlands National Park. For 11,000 years, Native Americans have used this area for their hunting grounds. Long before the Lakota were the little-studied paleo-Indians, followed by the Arikara people. Their descendants live today in North Dakota as a part of the Three Affiliated Tribes. Archaeological records combined with oral traditions indicate that these people camped in secluded valleys where fresh water and game were available year-round. Eroding out of the stream banks today are the rocks and charcoal of their campfires, as well as the arrowheads and tools they used to butcher bison, rabbits, and other game. From the top of the Badlands Wall, they could scan the area for enemies and wandering herds. If hunting was good, they might hang on into winter, before retracing their way to their villages along the Missouri River. The Lakota people were the first to call this place "mako sica" or "land bad." Extreme temperatures, lack of water, and the exposed rugged terrain led to this name. French-Canadian fur trappers called it "les mauvais terres pour traverse," or "bad lands to travel through." By one hundred and fifty years ago, the Great Sioux Nation consisting of seven bands including the Oglala Lakota, had displaced the other tribes from the northern prairie. The next great change came toward the end of the 19th century as homesteaders moved into South Dakota. The U.S. government stripped Native Americans of much of their territory and forced them to live on reservations. In the fall and early winter of 1890, thousands of Native Americans, including many Oglala Sioux, became followers of the Indian prophet Wovoka. His vision called for the native people to dance the Ghost Dance and wear Ghost shirts, which would be impervious to bullets. Wovoka had predicted that the white man would vanish and their hunting grounds would be restored. One of the last known Ghost Dances was conducted on Stronghold Table in the South Unit of Badlands National Park. As winter closed in, the ghost dancers returned to Pine Ridge Agency. The climax of the struggle came in late December, 1890. Headed south from the Cheyenne River, a band of Minneconjou Sioux crossed a pass in the Badlands Wall. Pursued by units of the U.S. Army, they were seeking refuge in the Pine Ridge Reservation. The band, led by Chief Spotted Elk, was finally overtaken by the soldiers near Wounded Knee Creek in the Reservation and ordered to camp there overnight. The troops attempted to disarm Big Foot's band the next morning. Gunfire erupted. Before it was over, nearly three hundred Indians and thirty soldiers lay dead. The Wounded Knee Massacre was the last major clash between Plains Indians and the U.S. military until the advent of the American Indian Movement in the 1970s, most notably in the 1973 standoff at Wounded Knee, South Dakota. In 1846, Prout published a paper about the jaw in the American Journal of Science in which he stated that it had come from a creature he called a Paleotherium. Shortly after the publication, the White River Badlands became popular fossil hunting grounds and, within a couple of decades, numerous new fossil species had been discovered in the White River Badlands. In 1849, Dr. Joseph Leidy published a paper on an Oligocene camel and renamed Prout's Paleotherium, Titanotherium prouti. By 1854 when he published a series of papers about North American fossils, 84 distinct species had been discovered in North America – 77 of which were found in the White River Badlands. In 1870 a Yale professor, O. C. Marsh, visited the region and developed more refined methods of extracting and reassembling fossils into nearly complete skeletons. From 1899 to today, the South Dakota School of Mines has sent people almost every year and remains one of the most active research institutions working in the White River Badlands. Throughout the late 19th century and continuing today, scientists and institutions from all over the world have benefited from the fossil resources of the White River Badlands. The White River Badlands have developed an international reputation as a fossil-rich area. They contain the richest deposits of Oligocene mammals known, providing a glimpse of life in the area 33 million years ago. For a more complete list of fossil animals discovered in the formations that make up Badlands National Park and surrounding areas, see Category:White River Fauna. Aspects of American homesteading began before the end of the American Civil War; however, it did not affect the Badlands until the 20th century. Then, many hopeful farmers traveled to South Dakota from Europe or the eastern United States to try to seek out a living in the area. In 1929, the South Dakota Dept. of Agriculture published an advertisement to lure settlers to the state. On this map they called the Badlands, "The Wonderlands", promising "...marvelous scenic and recreational advantages".The standard size for a homestead was 160 acres (0.3 sq mi; 0.6 km2). Being in a semi-arid, wind-swept environment, this proved far too small of a holding to support a family. In 1916, in the western Dakotas, the size of a homestead was increased to 640 acres (1.0 sq mi; 2.6 km2). Cattle grazed the land, and crops such as winter wheat and hay were cut annually. However, the Great Dust Bowl events of the 1930s, combined with waves of grasshoppers, proved too much for most of the settlers of the Badlands. Houses, which had been built out of sod blocks and heated by buffalo chips, were abandoned. Those who remained today ranch and raise wheat. As part of the World War II effort, the U.S. Army Air Force (USAAF) took possession of 341,726 acres (533.9 sq mi; 1,382.9 km2) of land on the Pine Ridge Indian Reservation, home of the Oglala Sioux people, for a gunnery range. Included in this range was 337 acres (0.5 sq mi; 1.4 km2) from the Badlands National Monument. This land was used extensively from 1942 through 1945 as an air-to-air and air-to-ground gunnery range including both precision and demolition bombing exercises. After the war, portions of the bombing range were used as an artillery range by the South Dakota National Guard. In 1968, most of the range was declared excess property by the USAF. 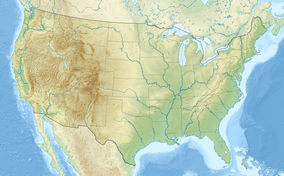 Although 2,500 acres (3.9 sq mi; 10.1 km2) were retained by the USAF (but are no longer used) the majority of the land was turned over to the National Park Service. In the 1940s, 125 families were forcibly relocated from their farms and ranches, including Dewey Beard, a survivor of the Wounded Knee Massacre. Those that remained nearby recall times when they had to dive under tractors while out cutting hay to avoid bombs dropped by planes miles outside of the boundary. In the town of Interior, both a church and the building housing the current post office were struck by six inch (152 mm) shells through the roof. Pilots operating out of Ellsworth Air Force Base near Rapid City found it a real challenge to determine the exact boundaries of the range. However, there were no civilian casualties. However, at least a dozen flight crew personnel lost their lives in plane crashes. The Stronghold District of Badlands National Park is co-managed by the National Park Service and the Oglala Lakota Tribe, and is a 133,300-acre (208.3 sq mi; 539.4 km2) area steeped in history. Deep draws, high tables and rolling prairie hold the stories of the earliest plains hunters, the paleo-Indians, as well as the present day Lakota Nation. ^ a b "Listing of acreage as of December 31, 2011". Land Resource Division, National Park Service. Retrieved March 5, 2012. ^ "NPS Annual Recreation Visits Report". National Park Service. Retrieved 2019-03-06. ^ Ullrich, Jan, ed. (2011). New Lakota Dictionary (2nd ed.). Bloomington, IN: Lakota Language Consortium. p. 855. ISBN 978-0-9761082-9-0. LCCN 2008922508. ^ a b c "Badlands Visitor Guide: The official newspaper of Badlands National Park" (PDF). National Park Service. 2016. Retrieved July 25, 2016. ^ "Badlands Wilderness". Wilderness.net. Retrieved March 5, 2012. ^ "Badlands Visitor Guide" (PDF). National Park Service. 2008. p. 2. Retrieved March 12, 2011. ^ "Badlands National Park". Rand McNally. Archived from the original on February 25, 2011. Retrieved March 12, 2011. The cultural centerpiece of this section is the Stronghold Table, where the Oglala Sioux danced the Ghost Dance for the last time in 1890. ^ "Pine Ridge Gunnery Range/Badlands Bombing Range". South Dakota Department of Environment & Natural Resources. Archived from the original on March 9, 2011. Retrieved March 12, 2011. ^ "U.S. National Park High Points". Peakbagger.com. Retrieved March 17, 2008. ^ "The National Parks: Index 2009–2011". National Park Service. Archived from the original on July 10, 2012. Retrieved March 5, 2012. ^ "Badlands - Frequently Asked Questions". nps.gov. National Park Service. Retrieved March 1, 2018. 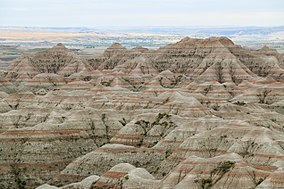 ^ "How Did Badlands National Park Get Its Name?". USA Today. Retrieved October 18, 2017. ^ "Campgrounds - Badlands National Park (U.S. National Park Service)". www.nps.gov.